*A Tale of 2 Monkeys*: Blog Award! 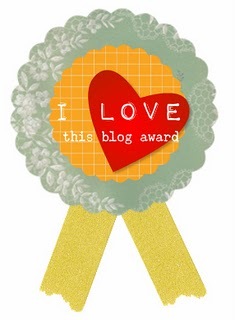 The very sweet (and awesomely geeky) Mandy of Chocolate and Cream Cake, gave me this beautiful award! Thank you so much! I would totally give it back to her, but I think I'm supposed to pay it forward. I'm also supposed to tell you seven things about myself. I'm sure you're sick of hearing about me after 30 days of Lists, but I will oblige! Plus, I have gained some new readers lately, so you might not know these things. 1. Over 2 trips, I have driven every one of the 2,448 miles of Route 66 that still exist today. And man, I loved it. 2. I've been married almost 3 years to the greatest guy ever. 3. I have two ridiculous cats named Ophelia and Kaylee (yes, she's named after the Firefly character). 4. I love to read and I will read just about anything from sci-fi, to classic literature, to young adult fantasy, to biographies. It's an addiction. 5. I have about 50 cameras in my collection, and I love them all. I am, however, terrible about getting film developed. 6. I have never been to Europe or Canada, but I have been to Mexico and Japan. 7. I am a CPA who is currently back in school working toward a second Masters Degree, most likely in Cultural Anthropology or History. ooh, cultural anthro. i had a hard time giving that one up when they told me i had to pick just ONE field of study. bleh. Yay! You're very welcome. And I love that you have a cat named Kaylee. Mandy - my friends, my brother, and I all have cats named after Joss Whedon characters (Wash, Spike, and Kaylee respectively). Hey, thanks for the award! Never gotten one of those before. Ashley - Of course, you guys rock!